Our complete line-up of Premium Billet Aluminum Mirrors set a new standard for the excellence in function and design. 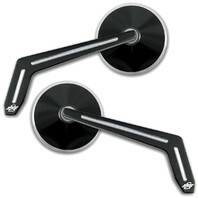 All mirrors feature a Stainless Steel Pivot that rides in a unique nylon bushing. This means our mirrors will never lose adjustment or rust at the pivot, a common problem on other mirrors. You won't find any unsightly adjustment screws on the back thanks to our unique method of construction. These Premium Billet Aluminum Mirrors include all necessary hardware to fit just about any Custom or Stock Harley-Davidson as well as Yamaha, Honda, Kawasaki, and Suzuki Metric Cruisers. CNC Machined from Billet Aluminum with Ball Milled Durable Black Anodized Finish. All Necessary Hardware Is Included. Fits just about any Harley-Davidson or Metric Cruiser. Oval Head measures 3". Weekend Warrior Stem measures 6-1/2" x 3". Size: Head 3" diameter -Teardrop Stem: 6" x 4-1/2"
Pirate Mfg is the leader in top-quality Billet Accessories for your Hot Rod, Camaro, Mustang, H2 & H3 Hummer, Jeep Wrangler, Toyota FJ Cruiser, and Toyota Tundra!